77,000 people, one of the largest pop culture conventions in the world, and yet ANOTHER WIN for farmers, priests and worms! Under the Apple Tree had been awarded the FIRST PRIZE ANIMATED FANTASY at the 2016 Dragon Con Independent Short Film Festival Atlanta (USA). Thank you very much, dear Dragon Conmen, and a big thanks to the Man from Atlanta! A number of guests had featured prominently in Dragon Con’s past, including artist Michael Whelan, director Ralph Bakshi, game designers Richard Garfield and Richard Garriott, and Jefferson Starship. New guests included actors Christopher Lloyd, Ernest Borgnine, Carrie Fisher, Martin Landau, and Sylvester McCoy, as well as artist Boris Vallejo. The streets of downtown Atlanta welcoming Dragon Con with banners on every light post and the Atlanta City Council recognized the convention with an official proclamation. Ask any Atlantan about Dragon Con and their first response is likely to be about the parade. The spectacle of thousands of cosplayers, young and old, dressed as their favorite pop culture characters marching down Peachtree Street is simply too much to resist. 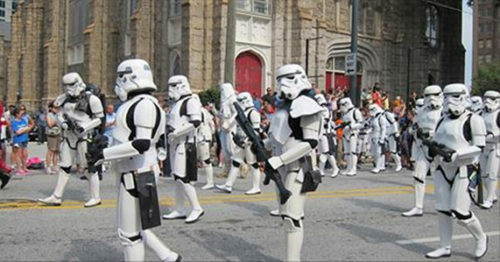 With an estimated attendance of some 75,000 people, the annual Dragon Con parade is the city’s best attended parade.